Finnegan "Finn" Sarazin Baron: Hello world! 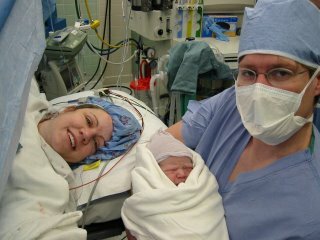 I was born on January 31, 2006 at 1:57am. I weighed 9 lbs, 5 oz, and I was 22 inches long. I'm happy to be here and I can't wait to meet my cat Emerson. I'm looking forward to watching Gopher Hockey with my Dad and learning to read from my Mom. Here's a picture of me with my Mom and Dad. Welcome to this world as we know it, glad you're here! Hey Finnegan! You made it! Nice job, Mom and Dad. Hope there's enough room for all those proud Grandparents! Hey Finn, what's up with your mom and dad's hats?